From the start, Theresa Ericksen's life was marked with adversity, yet she chose a vocation of service and self-sacrifice. Equally compelling is the fact that she came from neither wealth nor privilege, yet much of her legacy remains intact. Orphaned at age six, she travelled with her Uncle & Aunt to destinations as far away as China and Japan. A visit to St. Paul, Minnesota changed all that. Ericksen graduated from Northwestern Hospital's nursing school in 1894. She quickly made her mark. In 1898, Ericksen, along with seven other nurses formed the Ramsey County Nurses Association. Today we know it as the Minnesota Nurses Association. In 1898, Ericksen volunteered as a contract nurse for the U.S. Army and served at Sternberg Army Hospital in Georgia. She later volunteered for service overseas in the Philippines in support of Minnesota's 13th Volunteer Regiment. Taking her oath of service at the Presidio in San Francisco, she served as the regiment's only female member. Due to the shortage of nurses overseas, Ericksen remained in the Philippines longer than any of her fellow servicemen. Briefly returning to the United States, she later returned to the Philippines a second time and worked as a dietitian at the U.S. Army's main hospital in Manila. Ericksen eventually returned to the Twin Cities where she served in dual roles as Anoka County's Public Health Nurse and Anoka's High School Nurse. During America's involvement in World War One, Ericksen, once again, served overseas in France. She returned home in 1919. She resumed work in Public Health as well as her "fourth war" against Tuberculosis. Her longstanding advocacy of purchasing Christmas Seals to fund research in finding a cure for this malady culminates in a public ceremony in 1936. She became the first woman to receive Public Health's Distinguished Service Award, presented to her by the famed Mayo Brothers. Her last job was as Superintendent of St. Paul's Pleasant Day Nursery. While providing a safe, healthy, and structured environment for children, Ericksen also advocated on behalf of servicemen too debilitated from injuries to work, yet denied benefits from the government. A news reporter wrote "once she began steps to obtain compensation for a disable veteran, and judging from past accomplishments, general headquarters and the whole war department won't stand in her way." 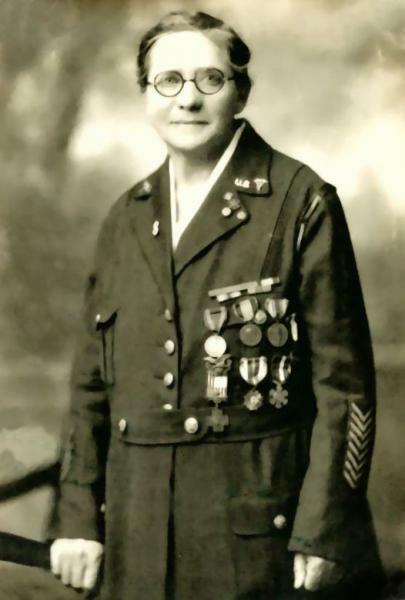 Associations, Spanish – American War Veterans, US – Philippine War Veterans, the American Legion, and until 1921, was the only female veteran in the Veterans of Foreign Wars organization. A service related injury eventually forced Ericksen into early retirement, yet she remained active, serving as a delegate within the many veterans' groups. Her popularity with the news media, resulted in numerous letters sent by fellow veterans who recalled her devotion to duty. She retired to the Minneapolis Veteran's Home. While there, Ericksen injured herself on the icy walkway. Her injury required surgery and long-term rehabilitation. Mr. F.W. Pederson, Commandant of the facility and fellow veteran, recommended she recuperate in warmer climate. Cognizant of her age and condition, Pederson inquired that if anything dire occur, where might she wish to be buried? She requested Ft. Snelling Military Cemetery, but such a request was impossible because the Cemetery was reserved only for active service members attached to the post. Serving as her advocate, Pederson petitioned on her behalf to the state representatives. Together, they successfully lobbied for the creation of the state's first National Cemetery benefitting not only Ericksen, but a growing number of veterans from America's recent conflicts. Completed in 1940, Ft. Snelling's National Cemetery serves as a final resting place for veterans who have honorably served. Ericksen died on 31 August 1943 and was laid to rest to the sound of taps and a twenty-one-gun salute on September 2, 1943. Her grave is in Section A, Block 11, Grave 1884. American Legion Post 102 ‘Edward Cutter' in Anoka, MN still sponsors a nursing scholarship in her name.